Laurelines: Playing with pens, collecting French sketchbooks! Playing with pens, collecting French sketchbooks! Even before I saw the great work in pen at the biennale des carnets de voyage, I'd decided to pick up this medium again and give it another go. I'd been drawing mostly in 8b pencil for the past couple of years. Much as I love the sensual, dusky quality of the soft graphite line, though, I'd begun to get tired of how smudgy it gets, especially when traveling and without recourse to spray fixative. I was even more determined, as I say, after seeing gorgeous ink and wash drawings in many of the sketchbooks on exhibit. On the train back to Paris, I couldn't wait to make some ink sketches---there's something about using a pen that encourages doodling and playfulness and the inclusion of text, too, don't you find? In the scant day and a half I had in Paris after the exhibit, I used my micron pens and a vertical spread in my watercolor block, to make a couple of sketches. Using the micron pens, I missed the ability to make swoopy, curly lines the way you can with a pencil, so I've resuscitated my dip pens and brush pens and am looking forward to limbering up with them. 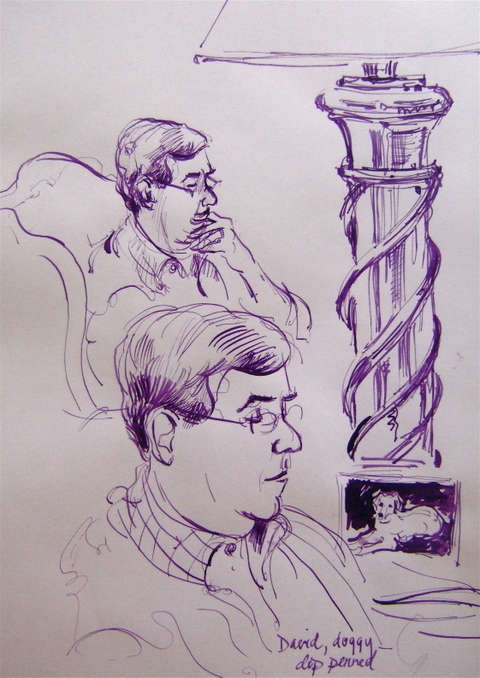 Yesterday, I made a first re-foray into the curving, dip penned line with a couple of sketches of my husband reading. A word to you readers of a Freudian disposition---sometimes a lamp is just a lamp. I can't wait to add some Schmincke hijinks to this playing around with pens! A really fun and synchronistic occurrence is my friend Ronell's current obsession with the pen. Click on her name to see what she's up to! Faravelli, Stefano. Mali Secret. Nouveaux Loisirs, February 14, 2006. Have not received this one yet, but remember it as being stunning. I'm a fan of his work. Flores, Enrique . India. Blur Ediciones. Fascimile edition of his small book of bold, lively watercolor sketches of India. Flores, Enrique. Cnadernos de viaje. Escuela de Arte de Mérida, Abril 2007. Unbound sturdy sheets of paper on which are printed both black and white and colored reproductions of his sketchbook pages, nicely packaged in portfolio format. Ladame, Sophie. Carnets d'Eole, vers les CaraÏbes. Éditions Cacimbo, 2002. Chronicles of a sailing trip in the Caribbean. Beautiful mixed-medium sketches in a large book. Marot, Geneviève. La France à Vivre; portraits de régions. Édition la Poste, 2007. A sketchbook commissioned and issued by the French Post Office, with sketches relating to stamps illustrating the regions of France. Charming, intimate, and fun. It would make a nice souvenir. Montigné, Michel. Carnet de Guyane. Éditions Sépia, 2003. Montigné, Michel. Carnets de voyages; Maurianie, Maroc, Brésil. Éditions Sépia, 2006. Robust and loose, lovely watercolor and pencil sketches in a large format. You can see his style becoming stronger in the three years since the Carnet de Guyane, listed above. l'Eclosoir, 2007. Indecipherable typefont but nice drawings! Small accordion book with reproductions of black and white sketches of a domestic interior. Studler, Elodie. Carnet de Voyage. Éditions Normandie Terre des Arts, 2007. 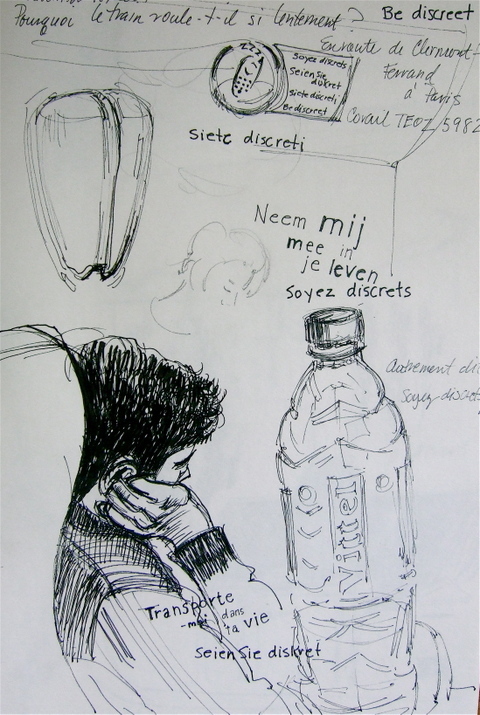 A selection of pages from various of her sketchbooks. 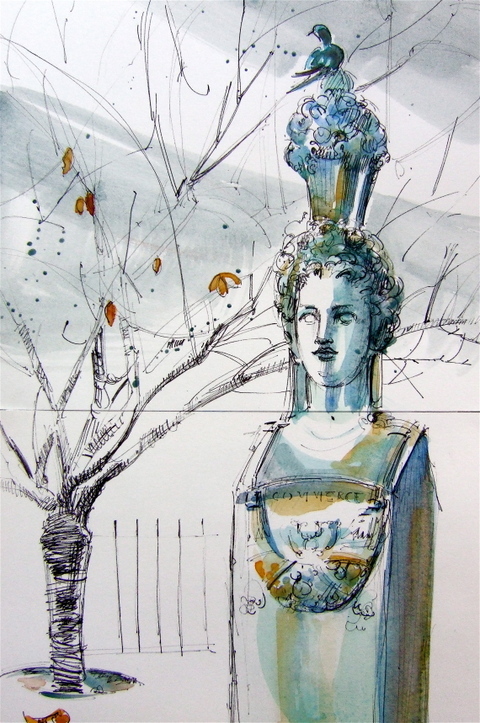 Watercolor, graphite, pen and ink---there are numerous examples of all three mediums. Nicely drawn. I love your drawing and your use of colour. These ones are amazing also. I thought I'd lost your blog, but NO, I've got it safely bookmarked. Thanks, everyone! I've had my studio upended for the past week, getting a new floor put in and this and that, so it's been hard getting artwork done. But I've been experimenting with pens, nevertheless---I'm really enjoying working with this very varied medium again! I love seeing the work of all of you who are using ink, too! Hi Laura, I already admire your masterful command of the pencil and now I will have more to admire as you take on pen and ink. Great move! I know what you mean about Microns not allowing for the more brushy lines you can accomplish with a soft pencil. Have you tried the Pitt artist brush pen by Faber Castell? I haven't graduated from the Microns yet but every now and then I take a leap into brush work with those. I like your lines in pen. Changing tools can be great for tweaking creativity. I was looking back on some sketchbooks from a year or two ago and realized how much better I liked the thicker pens I was using then--how the super fine lines I switched to just don't have the power of the thicker points. Time for me to do some changing too! Nice work. I can't even write legibly.